CORRECT! Good job on that one OHM...........Sadlbum had mentioned him on here before I think. "Hardeman, who lived behind the Georgie Robertson property, also had a fondness with the Tennessee Walking Horse. He owned, rode and trained several horses and was active in the National Tennessee Walking Horse Celebration. He was actually a judge in during the 1939 celebration and continued to participate with the celebration in the 1940s as both a rider and an owner. One of these horses, Maid of Cotton, won a Tennessee Walking Horse Championship and continued to live in the stable on the Hardeman property until Hardeman sold him. Maid of Cotton died in 1964. Hardeman attended the celebration until August 31-September 5, 1965, two months before his death. He had never missed a celebration in the 27 years of its existence up to prior to his death." 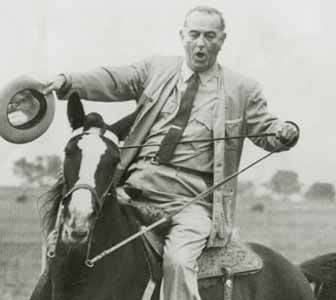 What was the name of LBJ's Tennessee Walking Horse? MIB you took the words out of my mouth with your comment about The Coach. There was nothing "locked up" about him. He was "walking all over" during that entire class! 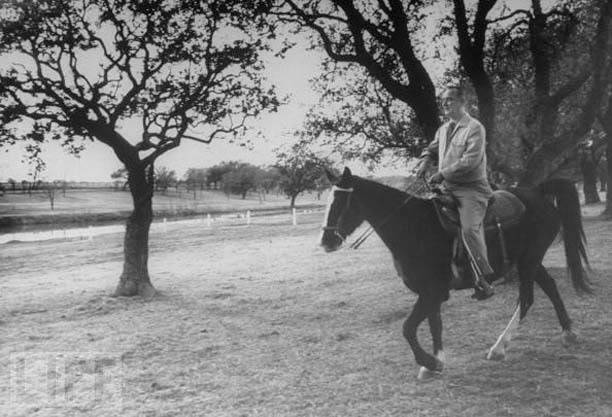 This horse was given to Johnson by his friend, Tennessee Governor Buford Ellington. More on LBJ & Lady B. next week.....! What 4th of July weekend Horse Show was known as the "Star-Spangled Horse Show" ? What TWH had the most PATRIOTIC name of all time??? 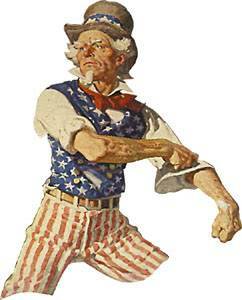 Oh, surely somebody remembers International Champion UNCLE SAM ridden by Herbert Derickson !!! How many of the World Grand Champions can you name that were also International Champions? That looks right to me, Curbchain. I admit I had forgotten about The Coach's win at the International last year. As I recall, he was outstanding. I will remember him as a good horse. Bob McQuerry has won the International Stake more than any other trainer with 5 total wins on 3 different horses. Ramsey Bullington has won the title 4 times with 3 different horses. Ronnie Spears has won it 3 times with 3 different horses. Tim Gray, Jimmy McConnell and Link Webb have all won the title twice; McConnell with one horse and Gray & Webb with two different horses. Two fathers & two sons have won the International Championship for a total of 5 Championships. (one father won it twice) Name the two fathers and their two sons and the five International Champions. You are correct, Curb.............and you're right, Tim Gray won twice, not Billy. 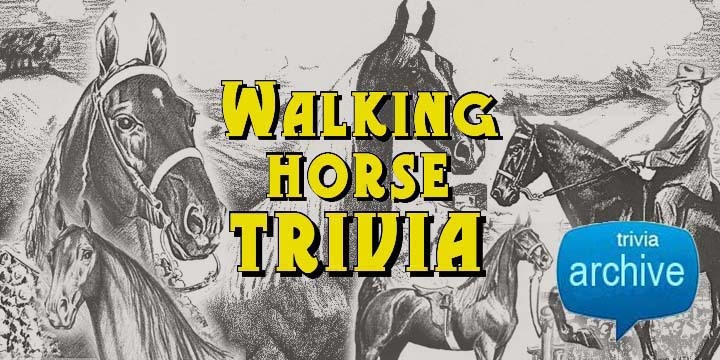 Which sweats more, a Tennessee Walking Horse or a Tennessee Mule? Actually, smitty, a mule doesn't sweat all that much compared to a horse. They require a lot less water too, which made them more useful for pulling conestoga wagons across the deserts. I sweat more than both. Name a WGC that also won the Championship Stake at the Indiana Celebration. Smitty, Sherri Dietz lost a brother to cancer a few wks ago.